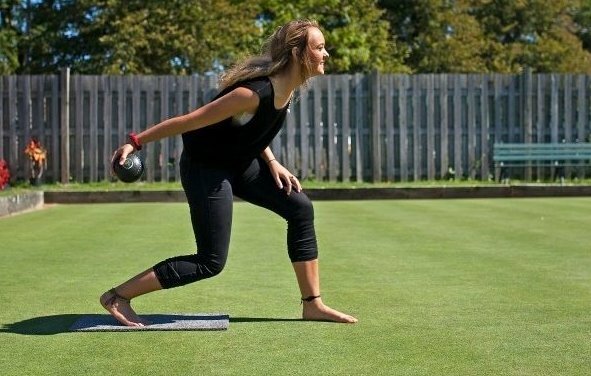 Sarisha Polder practices her throw at the Wanderers Lawn Bowling Club as part of a ‘bowls, barefoot and barbecue’ tournament Tuesday. As other Halifax university students cracked textbooks and took notes in the first week of class, some kicked off their shoes in the sunshine and took to the grassy rinks. About 23 NSCAD University students spent their first few days of the school year learning about lawn bowling for a design project, while also creating logos and crests to rebrand the game for the millennial generation and give leagues or events a hipster feel. “I was really taken aback because I didn’t know what lawn bowling was,” Freya Poirier, a second year student said with a laugh Tuesday after her team of three won the bowls tournament at the project’s wrap-up event at the Wanderers Lawn Bowling Club. “I had no idea how to play, but working as team it was really fun to learn the game and it’s actually really difficult. It’s a lot of skill and technique,” she said. The aim of the game is to roll slightly asymmetrical balls (called bowls) closer to a small white ball (the “jack”) than the opposing team, on playing areas divided into “rinks.” It likely brings to mind more senior players than hipsters, NSCAD professor of design Glen Hougan said. This is the second time NSCAD has worked with the Wanderers club, and Hougan said he loves the idea of using design to bring whole new populations and ages into a community they’ve never thought about. “The value of design is not just this pretty thing. It actually could be strategic thinking about how do you … get younger members into playing? How do you reframe it?” Hougan said. That inter-generational connection is something “we know we need more of” in today’s society, Hougan said, and challenges the ageist narrative putting up stereotypes and perceptions around who can participate in what. “A lot of people our age are rather competitive. They like to have a drink, like to socialize and it’s a very social game so that all plays off each other nicely for our generation,” Spindler said. Vince Landry, a long-time bowler and Wanderers member, said seeing young people playing the game is “fantastic,” and over the last couple of years membership has nearly doubled. Then there’s the hipster love of taking something old-fashioned and putting a new spin on it, Poirier added. “No one really knows of it … so it’s kind of like a new way for them to find a new trend, something fun to do with a group of friends,” she said.